Some unexpected things have happened with my readings habits throughout the years but one thing I never would have predicted is that I enjoy reading novelizations of movies I like to watch. It started because of Star Wars mostly and while I haven’t read tons of novelizations since I discovered I like reading those kinds of books, it’s a trend that will likely continue for many years. Recently, a little movie came out continuing the story began so many years ago with the release of Star Wars in 1977. That movie is Star Wars Episode VII: The Force Awakens and it’s pretty good. It’s not a masterpiece, but I don’t think anybody was realistically expecting one. Generally speaking, we wanted a good movie and we got a good movie. We also got a good novelization courtesy of the Grand Master of novelizations Alan Dean Foster. Though it didn’t really surprise me, The Force Awakens book was pretty darn close to the movie experience and so my reaction was essentially the same. This is not the best novelization I’ve read but it’s still good. In some ways, I like it more than the movie. In some other ways, I don’t. This mostly has to do with the fact that when I read the book I lose the good elements from the movie such as the actors’ portrayals of their characters and the movie’s visuals. I’m well aware that I’m not saying anything revelatory here. It kind of comes with the territory of novelizations. However, if I’m comparing this to my experience reading other Star Wars novelizations, this one falls a little short. That’s because the original trilogy’s visuals and the actors performances are engraved in my mind’s eye. My multiple viewings of the original trilogy actually supported and improved my reading of their respective novelizations. That is not the case with The Force Awakens. I’ve seen it once and while the viewing was fresh it my mind when I read this book, I simply don’t have the same familiarity with it that I did with those other movies. Overall, the book sticks pretty close to the movie. There are a few added bits in the story. Most of that is added dialogue or, more accurately, expanded dialogue scenes and a few bits of narrative exposition which provides some context or background for scenes in the movie. I wouldn’t be surprised to discover that the added dialogue was originally included in the script and cut out of the final film. The movie limits itself to the essential but the novel gives these conversations room to breathe. The novel as a whole simply has more room to breathe and that’s one of the things I enjoyed. The movie's primary strength is its characters and while it's nice to see the actors portray them so skilfully and convincingly, it's nice that the book gives readers a chance to spend more time with them. The novel offers us reactions and some commentary from the characters thoughts during and after key conversations or encounters. Reading the book just after seeing the movie gives the added benefit that you can see a little bit of the actors’ portrayal from the movie in your head while reading. Not very clearly, mind you, but some visuals, body language, and particularly specific enunciations jumped out at me while reading. Some of Rey’s dialogue stuck with me for a few scenes. Admittedly, that’s less of a commentary on the novel and more soon the effectiveness of Daisy Ridley’s performance. One of the main reasons that I’ve come to really like novelizations is that the books often include information on the world, the characters, and the plot of the movie that didn’t make it to the final cut of the film. In addition to this, some authors get more freedom to explore certain ideas in more depth or even get to add some of their own. Having read a few interviews from writers like Foster I learned that sometimes they get more freedom and sometimes they’re limited to rewriting the script in a different format. Unfortunately, the novelization of The Force Awakens is pretty much the script brought to life. I’m not entirely surprised by this because Star Wars is a huge property for Disney. The Force Awakens is their first big official step into a new era of the franchise. It makes sense that the novel doesn’t stray much from the film. What’s added seems like bonus material and deleted scenes more than it feels like embellishment. I’m a little disappointed by this because Foster a good writer. If anyone can successfully expand or embellish this movie it’s him. Having said that, Foster provides readers with a fair amount of interesting tidbits that are not included in the movie. For starters, the Republic Senate is not the same organization as the Resistance. We learn that it’s a separate organization working in direct opposition to the First Order, effectively protecting the freedom of the Republic but not working for the Republic. The book does suggest that the Resistance and the Republic aren’t always in agreement. Not much more is said, however, and there is a lot of information to be sorted out in future films. In my opinion the underdeveloped political makeup of the movie is one of its week points. I don't think we can fully understand the characters if we don't understand the organizations they associate themselves with. The novel works toward making those organizations and governing bodies clearer. Finn is the easiest because we’ve understand what the First Order stands for, it’s very similar to its predecessor the Galactic Empire. The movie does a good job of making it clear that stormtroopers are stolen from their parents at a young age and indoctrinated in the ways of the First Order. As such, with our clear understanding of the First Order, Finn’s character is also clear even if his character arc is mainly about finding himself. The lack of information given to us in the movie about the Resistance is a shame. I understand that the movie is the first in a new trilogy and it’s setting up this new time period in the franchise. Perhaps the next movie will give us more information. If not, then at least we have the short explanation included in this book. Aside from the distinction between the Republic Senate and the Resistance, most of the additional information in the book is character based and fills gaps in the movie. We learn why Rey is so good at flying pretty much anything she gets her hands on. It’s simply because she’s been piloting anything that she finds since her childhood. We also get a quick and simple explanation for her mechanical wizardry. Another nice character bit, like how she can kind of understand Chewie when he speaks, are simply very enjoyable to read. The novelisation includes about half a dozen completely new scenes not present in the movie. One of them expands on Poe’s story. Specifically, we learn about what happened to him after crash landing on Jakku. We get more time in Maz’s place where Plutt tracks down Rey and tries to bring her back to Jakku. We even learn that she was left in his care! I can hardly believe it. Another good addition is the one where Threepio proves to be an essential part of the plot as he’s the one who tracks down Beebee-Ate’s signal and brings the Resistance to the rescue at Maz’s place. In case you wanted more action on Starkiller Base, there is a speeder chase scene reminiscent of the speeder scene in Return of the Jedi. I delighted in an awkward celebratory moment between Rey and Poe near the end of the book. It’s nice to see them interact without Finn. As a whole, I’m satisfied with this book. I’m not blown away, but you don’t read novelization for big surprises. You read them for small surprises and for curious fans there are some nice small surprises in this book. Foster’s prose is direct and without too many flourishes. He’s a professional and his writing shows it. The prose was a little clunky in the first couple chapters but the style smoothed out as the book progressed. If you enjoyed The Force Awakens I don’t see why you wouldn’t enjoy this book. I like that it lets the story and the characters breathe, though you might miss the movie during the more action heavy scenes. It’s a not a must read but it’s an enjoyable read, particularly for bookish fans of Star Wars. 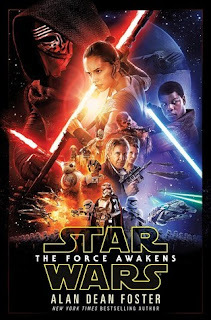 Buy The Force Awakens (Star Wars) novelization at Amazon.